The luck continues, our third heifer in a row by Rim Rock and Dumplin. 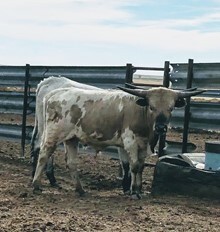 She is full sister to Dimple Doll (2013 Heifers) and Dazzle Doll (2014 Heifers) but this one is black and white instead of grulla and white like her other two full sisters. We are so excited to watch these three beautiful heifers grow and mature. Outstanding back ward horn direction and base.